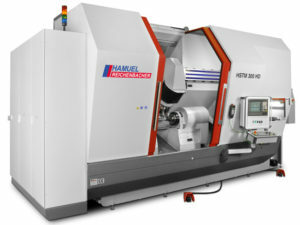 The HSTM series consists of CNC turn-milling machines with a horizontal work piece orientation. The HSTM series provides cost effective CNC manufacturing of high precision work pieces such as turbine blades, blisks and impellers. 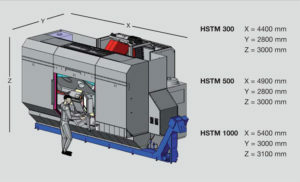 The HSTM series is based on a horizontal machining center. The entire unit is tilted forward by 45° for optimized weight distribution and visibility of the work piece. With a surface quality of up to Ra=0,8 μm, the Hamuel HSTM Series meets the highest standards of modern blade manufacturing technology. Cutting edge drive and control technology guarantees high productivity and flexibility; the rigidity of the HSTM series allows accurate high speed cutting. The machine is built as a single machine body, with all components optimized for milling of work pieces in a horizontal orientation – especially turbine blades. Rotary axes with standard interfaces provide the highest productivity in precision machining. The compact design of the machine allows a quick and trouble-free installation without any special requirements. 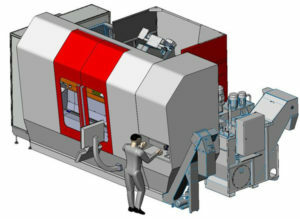 The modular concept allows for easy customizing to meet the specifications of your machining process. 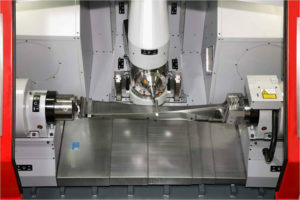 The motor-milling spindle allows for machining of a wide variety of materials. High spindle speeds for aluminum and high spindle power with slower spindle speed for Titanium are available in the same Motor Spindle. Cooling and lubrication systems are integrated with outer cooling, high pressure, and minimum quantity lubrication through the spindle or outside of the spindle. An exhaustion system for cleaning the cabin air is also available. The Hamuel HSTM is available for demos in our Middleton technical center. Call INIRAM at 978-854-3037 to schedule a demo for your CNC milling and turning application.